M & M(r) candies has a marketing tie in that makes sense. To coincide with the release of the much anticipated movie "Shrek 2"(tm) the candy company has announced super sized candies. Calling them "Ogre Sized" is just plain fun. Seth Godin would be proud of the fact that they are doing something with this long established candy brand worth talking about. They loose points for not having the website ready for the contest they announced to guess how many Ogre sized M&Ms fit in the Grand Canyon. Boo. Before you go off ranting about how this contributes to the obesity of children relax, remember it's candy and have some M&M Minis. 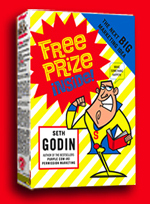 Thinking will be the final stop on the May Business Blog Book Tour featuring Free Prize Inside by Seth Godin. If you are new to new to the Business Blog Book Tour find our more here. If you want to find out who else is on the tour check here. If you are wondering what the book will be about click here for a summery. To start your thinking about Free Prizes and how you business might include them check Seth's thoughts here. Plan to visit on Friday, May 14th for the final stop on the tour. Go ahead, put it on your calendar.